1. Ang Lee's NC-17 version of Goldilocks was never fully embraced by Red State America. 2. "Yes, Uncle Sully, your leather vest is fetching. Speaking of fetching, should I grease up and put on the dog collar now?" 3. "Sorry to interrupt your plushy role-playing, Mom and Dad... and Uncle Roy. Carry on." 4. And then Billy accidentally came between Momma Bear and Baby Bear. Death came swiftly. 5. "Wow, who would have thought Bears would have such an elaborate sexual dungeon in their basement?" The producers of 24 decided to cast Ricky Shroder and a few other cast members to bring in younger viewers for Season 6. Mama bear was a terrorist mole while Papa bear hibernated the whole season. It was truly sad day when they released The Star Wars Christmas Special: Special Edition. 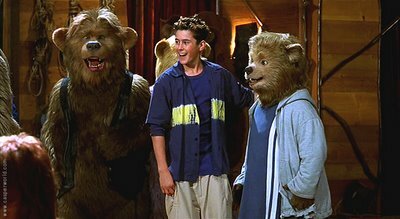 Rex Grossman was lulled into a false sense of security during the photo-op with the Bear's owners. After the media left, they tore off his head and marinated his ribs for the next tailgate party. On a very special ABC after-school special, Billy Flannigan learns about the dangers of taking Ecstasy and attending non-human raves. Hey, Hey, HEY! What the heck are you doing to my bum, Baby Bear? "Yep son, your mother and I never used protection, that's why we named you Boo-Boo." "No I don't know. Tell me, what IS bear back?" "Bears, Ewoks, what's the difference? You people all look the same to me." "Now if I mimic their every move, maybe they'll think I'm one of them....there's gotta be a way out of this place somewhere!" Hey big daddy! Where's that Goldielocks bi-yotch? I'm in the mood for a little "porridge" if you know what I mean? Now y'all promise that "What happens at Avalon Manor STAYS at Avalon Manor" right? Andrew Sullivan woke from his dream and screamed "Ahhhh I would never wear pleated pants". "Ho-boy, Billy, spiking the shower soap with Rogaine was funny, but not nearly as funny as what Mom and I are going to do with your college fund..."
Why yes, Billy, you are adopted.